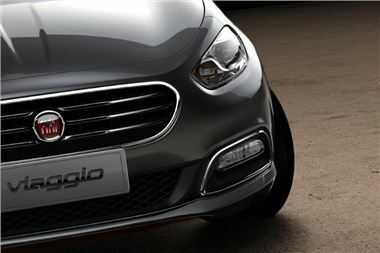 FIAT has published teaser photos of the Viaggio, a new 4-door saloon being built in China that will have its world preview at the Beijing International Auto Show on Monday 23 April. Viaggio translates to 'voyage' in English, while its Chinese name Fei Xiang which means 'flying'. It is the first all new Fiat-Chrysler car apparently delivering "a unique blend of power, fuel efficiency, sophistication, technology and vehicle dynamics, beautifully clothed in a distinctive Italian design." The four-door, five-seat FIAT Viaggio is based on the CUSW (Compact US Wide) floorpan, which is also the basis of the new Dodge Dart, presented at the Detroit Motor Show in January. The CUSW floorpan was originally developed for the Alfa Romeo Giulietta. The FIAT Viaggio is 4,679mm in length, 1,850mm in overall width, with a 2,708mm wheelbase. The Viaggio will be the only car in its segment to offer solely turbocharged engines: the 1.4l T-Jet in both 120hp and 150hp outputs matched to either a 5-speed manual transmission or the latest 6-speed Dual Dry Clutch Transmission (DDTC) developed by Fiat Powertrain. Designed by the FIAT Group Style Centre in Torino, the new Fiat saloon will be the first car to be produced in the new GAC-Fiat World Class Manufacturing plant in Changsha, Hunan province. The first cars will be produced from July and will go on sale in the third quarter of this year.